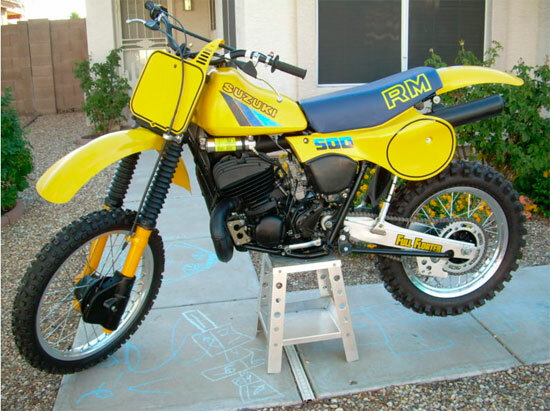 1983 Suzuki RM500D, First year for the powerful Suzuki RM500. This Bike started out as a low time bike, It has a fresh .050 Bore with NOS Suzuki Piston, Ring, wrist pin and bearing. The frame was then sand blasted and powder coated along with the triple clamps. New steering head bearings were installed. Bike still has original handle bars and kick stand! No Pitting on fork tubes or shock shaft, Lower fork legs in like NEW Condition! No corrosion on this bike it has been in the dry desert all its life. And covered up on a stand for the last 10 years. NOS Suzuki parts were used extensively during this restoration and most are no longer available today. Bike is ready to race or display, the motor has not even been started with the new pipe and silencer. You will not find a nicer example of a 1983 Suzuki RM500 anywhere, and I don’t think you could ever find all the NOS NEW Suzuki parts that are on this bike. I am sure I have missed many parts I have installed over the years but you get the idea that this is a ONE of a kind bike.